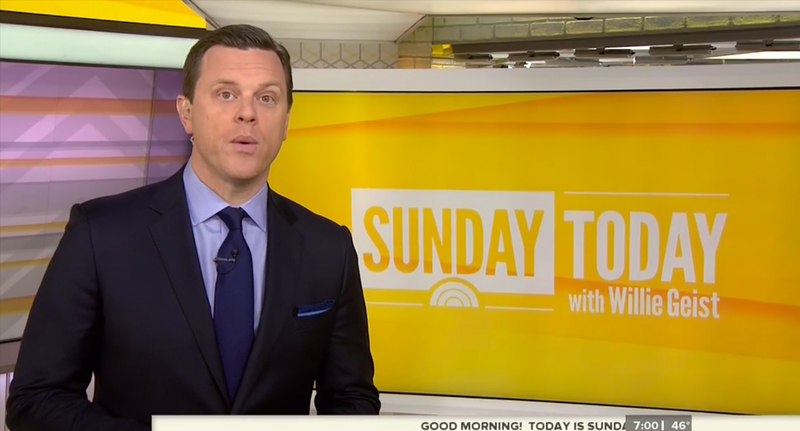 NBC News‘ revamped “Sunday Today with Willie Geist,” debuted Sunday from its weekday counterpart’s iconic Studio 1A — but managed to have its own look and feel as well as find new ways to make use of the space. 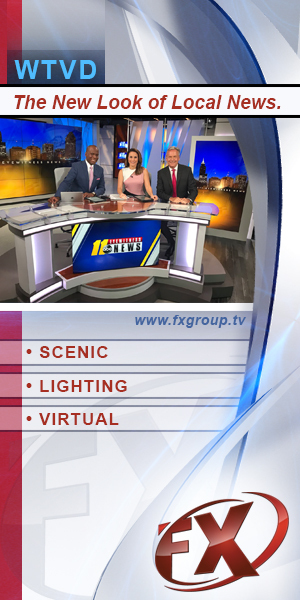 The show opens with a short sound bite and image “collage” of the week’s events but no voiceover or no traditional pre-show tease elements. Similarly, the open also lacks an announcer. From a visual standpoint, the new open emphasizes layered boxes with thick frames, which tie in to the show’s narrow typeface logotype unveiled last week. 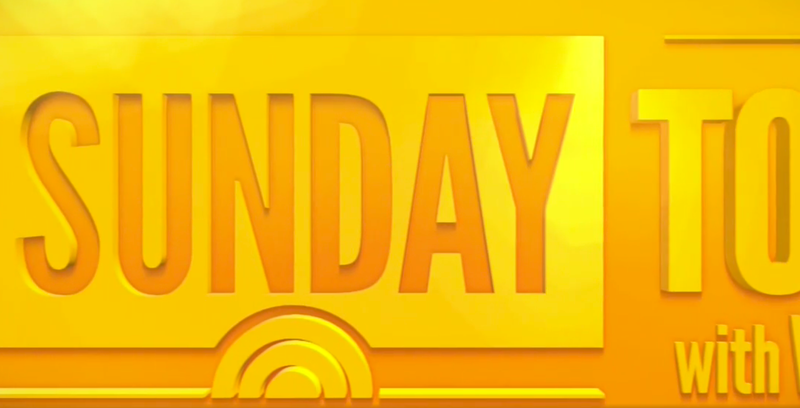 Taking a visual cue from oranges found the weekday edition’s logo, “Sunday Today” has opted for a brighter shade of orange-yellow for its dominant color, which is also found in the open. Likewise, the in-show graphics and on-set imagery also make use of the more condensed font set within golden yellow and white boxes, almost to a bit of an extreme that makes one wonder if the show’s main sponsor is a lemonade stand. 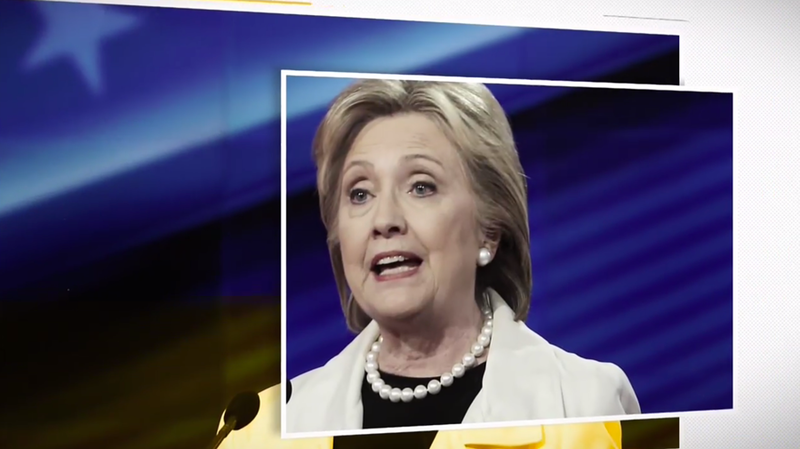 The show’s animated bug takes hints from the recently introduced “NBC Nightly News” design, alternating between the full show logo — including host name — lockup and the NBC peacock, which appears in full color before shifting to yellow shades. The boxy theme is kept through the use of animated outlines and boxes that “open” on screen between the designs. The final result is a bug that, like the one used at “Nightly,” a bit distracting. For its set, “Sunday Today” remained in the main first floor area of Studio 1A. The show started in front of the large touchscreen often used for weather reports on the weekday edition of “Today” with slivers of the Orange Room visible behind it. The Orange Room, incidentally, probably needs to be rechristened the “Yellow Room” on Sundays as the normally orange and white color scheme is gone in favor of the Sunday yellow. 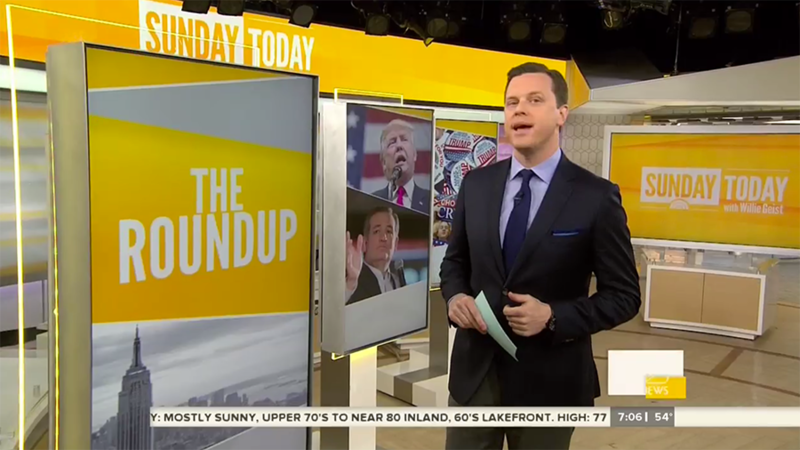 For a segment called the “Roundup,” which serves as sort of a news update and summary, Geist uses a series of vertical flat screens edged in glass with an edge lighting effect that are arranged around the outer ring of the corner of the studio. These screens allow Geist to “talk” to reports in the field as well as display topical graphics. 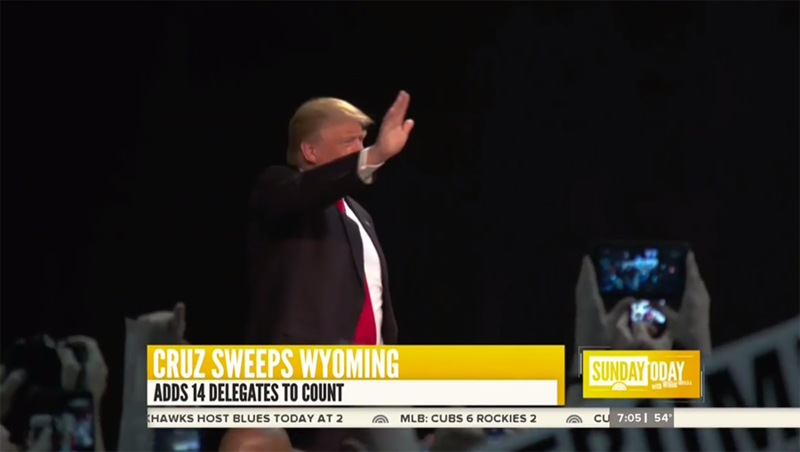 Meanwhile, the show’s LED header is decked out in bold yellow and the show’s logo and remains visible on screen much of the time. Other graphical elements of the package also begin to be more prominent here — namely black and white and monotone photography of New York City and, more specifically, imagery associated with Rockefeller Plaza. 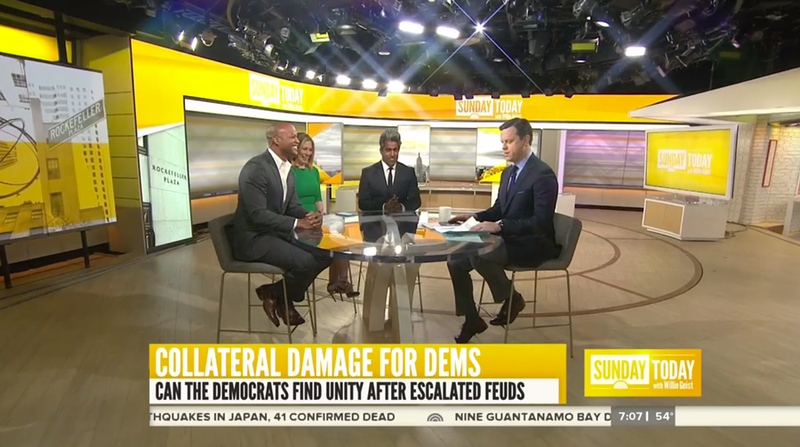 The show’s roundtable segment, meanwhile, uses a glass table that’s placed outside of the ring where the show’s normal anchor desk sits. For this portion of the show, the vertical flat screens and large touchscreen remain visible in the background, with shades printed with a subtle diamond pattern pulled down over the studio’s windows filling out the rest of the background. Here again, the Rock Center photography is prominently used behind panel members, as well as on the movable panels in the show’s production area to the left. “Sunday Today” has done a great job of finding new ways to, with just some minor additions to the set, give Studio 1A a unique look. 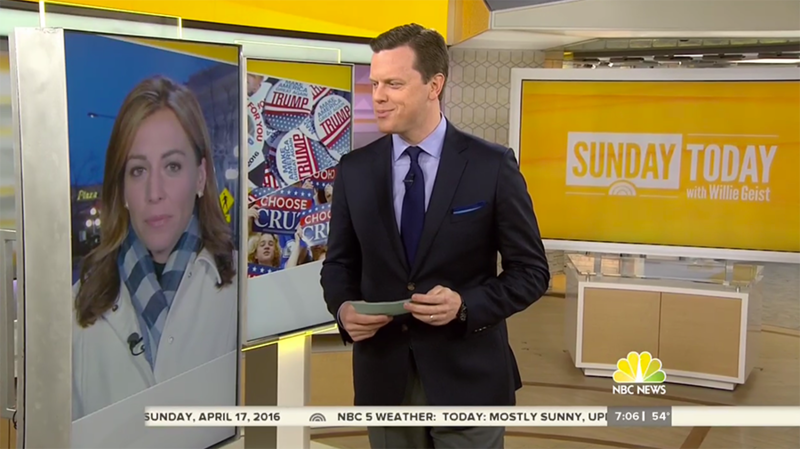 However, the condensed typography, boxy design motif and rather alarming shade of yellow also doesn’t convey a soft image that one might expect on a Sunday morning broadcast.